I am an educator by trade, though I have been a learner and a leader all of my life. Years ago, I wrote a blog post called Learning to Lead Learning Since 1979 that goes into this topic in more depth, though I think the sentiment comes through just fine in my personal mission statement. My purpose, as I see it: to cultivate communities of learners and learning by connecting with people, bringing shape to ideas, and seeking to understand. Thankfully at this point in time, I have found myself professionally tied to a merry band of travelers who each seem to share at least a modicum of that mission in his or her own heart and mind. Together, we canvas the country seeking to be the learning partners that educators and school districts deserve as they venture into the unexplored reaches of their professional identities. In this team, I feel that I have found my tribe. We embody the feeling of a family- a feeling that I experienced to some extent in my previous career points, though has been amplified with this group in recent months to levels unexperienced to date. That said, within the construct of this job I get the opportunity to visit cities all across these United States, and usually do so all by my lonesome. While I am traveling independently, I do interact with countless numbers of people while on the journey. In those travels, I have noticed that I tend to operate in slightly strange ways. At least strange relative to your average person. I am always a visitor, everywhere I go. I find myself walking through downtown streets and across suburban highways, meandering, seemingly aimlessly, because I can. I am a visitor here- I am not permanent. I end up in conversations with strangers, listening for the soul of the city while also attempting to help that person know that they have a friend for today- someone who will listen and help them find that they can in fact take that next step (terrifying as it may be). I do all of this because if I start the trip as a visitor everywhere I go, I need to end with that new place feeling like home. if I have to be away from my home in order to serve as this learning partner, then I figure I might as well try to help home feel like it came with me. Her response got me thinking. Not even my teammates- those who “get it” more than any other due to our shared experiences out in the field- not even they necessarily understand my way of being. I felt as if I needed a way of communicating the why of my approach to life such that it could be understood- not only by them, but also a little bit better by me. Imagine for a moment that one day, you decided to live as if every person you have ever met or will ever meet is on your team. You are here for them, they are here for you, and we are all moving forward together in the same direction for a common purpose. How might that mindset change the way in which you live your life from that day forward? What I realized is, this is how I live. This is what I do. It resonated so closely with my own experiences, and like a lens brought everything into focus. Imagine for a moment that it was true, that everyone was on your team. That would include Stephanie, a waitress in North Carolina who is 5 months pregnant with her first child, and her boyfriend, whose name I can’t remember though is no less central to the next steps within their family unit. If they were on my team, I would want to help them process their excitements and their fears about this huge step in their life. If they were on my team, I would want them to embrace the size and scope of this step. If they were on my team, I would want them to recognize how much their lives are going to change, and take steps from here on out that would help them prepare a world for that new little boy in which he will be successful. I have never been brave enough to consider taking a similar leap, so I applaud anyone who is willing and able to do so, so long as they take the responsibility of that leap as seriously as it is. While I will never meet them again, I hope that one evening’s conversation proves to be a helpful one for that new life entering the world and the parents that will help to grow it. If everyone was on your team, that would include a team of researchers on a business retreat that I just happened to walk by one evening. They were sitting in a 25-person circle out on a restaurant’s patio, enjoying each other’s company as one whole after a hard day’s work. If they were on my team, I would want them to recognize how special it is that they elected to circle up as one whole versus sitting separately in several small groups, as such a way of being promotes team unity in ways unimaginable without it. It’s a rarity I do not often see, and if they’re able to name it, then they can replicate it. While I will never meet them again, I hope they keep on making circles of conversation from here on out. She jumped onto the team with open arms. Linda was a fantastic teammate. And if she were on my team, I would want those who work with her to know the lengths she went through to help me such that we could reinforce that behavior. So I made sure to fill out the survey at the end. It’s a small gesture, I know- but it’s the thought that counts. The number of customer service representatives I have since been able to help in that way (because of their dedication to helping me) is moderately staggering. One night, I had been struggling to get access to my bank login and password in order to print out some statements, and finally decided to call customer service. The teammate on the other end of the line (ironically also named Linda- what is it with people named Linda and their willingness to help?) stayed on the line with me at 1:30am CDT for over an hour trying to figure out the issue. Once we finally got it figured out, I asked if there was any way I could be as helpful to her as she had been to me, to which she responded that I could share my thoughts with her supervisor. I did so happily and with fervor, even with it being almost 3am by that time. These people are all on my team. We are here to help each other move forward, and as I come to embrace that role, I realize that it will take a constant level of personal vigilance to ensure that I continue to make decisions in my life such that I can continue to serve in this way. What’s amazing to me- none of the stories above about the people I’ve met and joined on my team include any of the incredible educators I have had the privilege to serve. I could tell stories about them for days- I am blessed to have played a small part in their professional journeys, as they have played a large part in mine. They are by default part of my extended family, which grows exponentially by the week. Of course, that level of commitment to service isn’t really all that strange, and frankly I have plenty of real estate to tell those stories in the context that they deserve in order to help others learn from those practices. This way of thinking was highly influenced by one of my former and forever teammates- a lead coach who has since taken a role as a site-based leader. When I elected to take on this role full-time starting last year, she asked me, “Where will you find your team?” Knowing that being part of a team was important to me, she worried that being out all on my lonesome would end up causing some level of angst. Little did she know the mindset that would emerge as a result. That said, Spider-Man also taught me and everyone else something important- that with great power comes great responsibility. I do think (as my teammate mentioned) that I have a gift. A gift for connecting with people. A gift for bringing shape to ideas. A gift for seeking to understand. And I think I also have the responsibility to use that gift in service of others in order to cultivate communities of learning. That responsibility brings with it the importance of ensuring that every choice I make in my personal and professional life is also in service of that mission. To do otherwise could potentially cause irreparable harm that would derail that mission, and that mission is far too important to run off track. It’s been in various stages of development from anywhere between the past several months and several years, and I think it’s finally in a place to publish officially here on the blog. 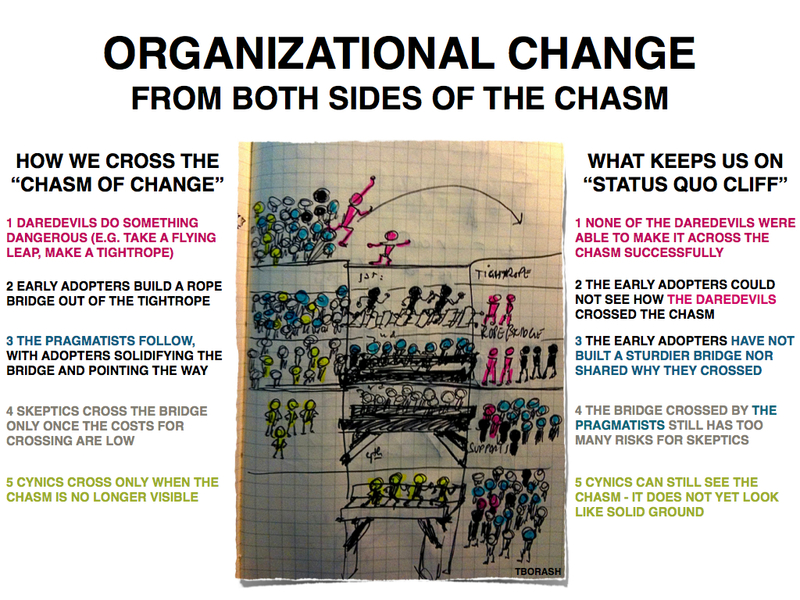 The image above employs a variation of Rogers’ Diffusion of Innovations (referenced previously in Indiana Jones and the Early Adopter’s Dilemma), exploring how five different types of people within a group approach change (signified here and in many other org change models as “Crossing The Chasm”). 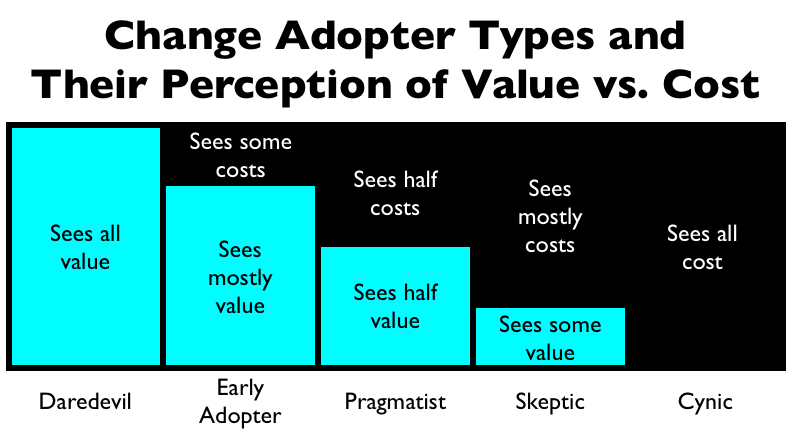 Note: I have purposely changed the names of these “adopter categories” from those I’ve seen in references to Rogers’ work, who uses the terms Innovators, Early Adopters, Early Majority, Late Majority, and Laggards. For a variety of reasons, I prefer the titles of The Daredevils, The Early Adopters, The Pragmatists, The Skeptics, and The Cynics. More on that later. What do you like about this model? What would you change? How do your own experiences match up to this model? How do you envision using this way of thinking in considering change within your own organization? 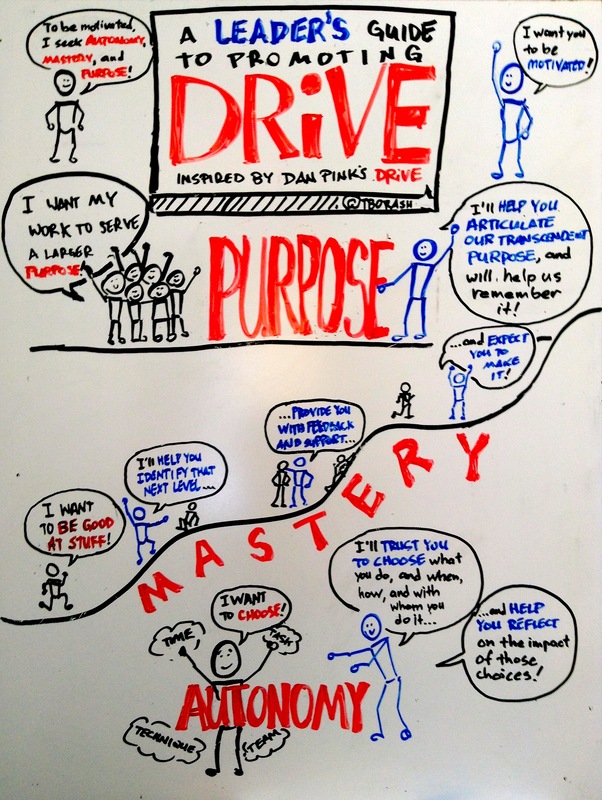 Here’s my addition to the fray: an image that I’ve wanted to draw for upwards of a year about how educational leaders can promote teachers’ internal motivations based on the principles of Dan Pink’s Drive. I may write more about this later, but for now I’ll let the picture speak for itself. Thanks to Scott for inspiring us all to share our learning! Risk-taking, envelope-pushing innovators get a lot of the publicity these days when it comes to the front lines of 21st-century education, and for great reason. Innovators deal in What’s New, and What’s New pops. What’s New flashes. What’s New gleams. What’s New splashes onto the scene. What’s New is the future. The future that once seemed so far away, and now is so close you can literally reach out and touch it. And What’s New- especially right now in K-12 education– is out-of-this-world fascinating in the opportunities it provides for student learning experiences. In the face of this continuously evolving landscape, the innovator’s dilemma (not to be confused with Clay Christensen’s work of the same name) is clear: keep moving to What’s New, or start building on What’s Now. And since innovation by definition has to keep on moving (like a shark that needs to keep swimming in order to breathe), those drawn to innovating will tend to keep moving, too. Upon the introduction of a disruptive innovation, Christensen’s Innovator’s Dilemma (summarized in this sketchnote video) reveals that those who once led the field have a decision to make as well: Adapt or die. Shift practices or fizzle out. Since those who have experienced success seek to keep being successful, they may not recognize the paradox that a change in implementation practices may be required in order to achieve the same outcomes. The tension between changing practice and maintaining success leads to paralysis, and past achievement leads to present stasis. How do leaders help to inspire this change in practice? From an organizational perspective, I have recently grown interested less in the concept of competing organizations as described in Christensen’s work, and more in Rogers’ Diffusion of Innovations (one of the referenced works in Gladwell’s The Tipping Point), which deals in how communities grow and learn based on the ways that its individuals approach change. And while the Innovator’s Dilemma is certainly interesting within that context, I’m more drawn to the dilemma of the Early Adopter. Who is this Early Adopter? The Early Adopter is often seen as a leader, though is not always first to change. They are described in a variety of sources as having a high degree of “opinion leadership” in the community, which I suppose is due to their boundary-spanning role as both “first follower” of the Innovator and “trusted translator” to the majority. This video clip from Indiana Jones and the Last Crusade serves as the context for what I see as the pivotal stakeholder group in the process of organizational change. 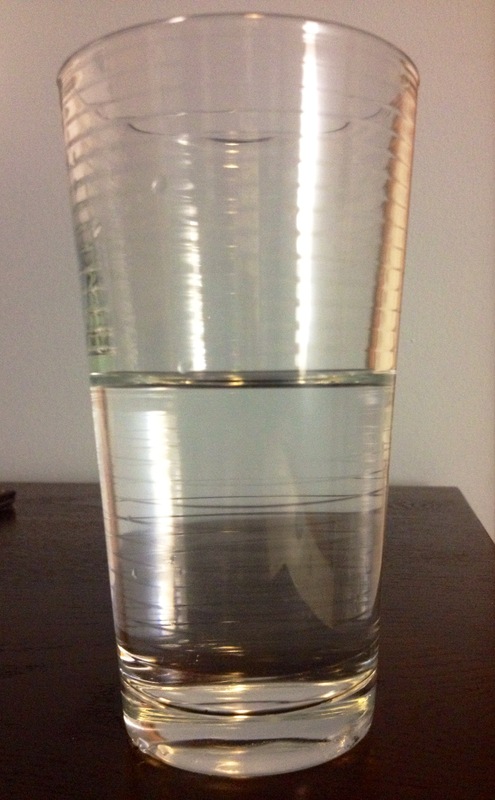 On his quest to find the Holy Grail (literally), the Early Adopter comes to a chasm in the path. Puzzled, he pauses to review his options, his resources, and his motivations for moving forward. Armed with a map of the Innovator’s past, he knows the chasm can been crossed successfully before. What motivates his quest? Not only sating his sense of adventure, but also saving someone close to him. …and realizes there was a path all along, one he could not see from his previous perspective. Walking with trepidation at first, he soon speeds up as new perspective makes the connection more clear. Eventually, the Early Adopter becomes the newest adventurer to cross the path. At this point, he faces the Dilemma’s second stage: Continue to sprint ahead in the Innovator’s footsteps? 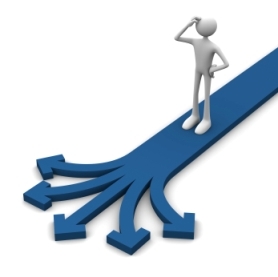 Or find a way to help clarify the path for future travelers? (Not pictured in the video): In the face of both personal success and situational distress, the Early Adopter takes a moment to mark the path for whoever comes next. This decision distinguishes him from those who first ran ahead. So then, what is the Early Adopter’s Dilemma? The Early Adopter’s two-stage dilemma starts with one key decision: in the face of the What’s New, do I choose stasis or change? Do I take a leap of faith, trusting in what I’ve seen of the Innovators’ successes and challenges? Or do I stick with what has worked for me up to (and perhaps including) now? More often than not, these individuals will see the benefits of successful changes as outweighing the costs, and will move forward with the innovator’s quickly scribbled map as their guide. The second stage of the Early Adopter’s dilemma emerges once they experience What’s New. This second stage is wrapped around the exact same decision of stasis or change, though in a more others-focused context: Do I keep sprinting ahead? Or do I stop just long enough to make it easier for those who follow to know what to look for (and what to avoid)? Thankfully, the Early Adopters have a desire to stop and throw that handful of sand on the previously invisible path. Otherwise, the rest of us would be lost. Find your Innovators and watch they do. They will most certainly show you What’s New. Let them do their thing and take the risks that identify the What’s New that is of interest to you in your situation. Find your Early Adopters and listen. Share a proposed change, and ask them to talk through the costs and benefits they see. They will likely see the benefits of successful changes as outweighing the costs, and will articulate those benefits in a way that will help to clarify the Why of the change to What’s New. Share the Why that you heard from the Early Adopters. The perspective shared by this trusted group will help identify exactly what would make What’s New intriguing and accessible to the majority. Change leaders, follow your Early Adopters. Their perspective will help guide your team across the chasm of the unknown, but only if you take a moment of pause to find them and listen. Learning in order to lead learning again, this time by exploring a really freaky phenomenon. Is that not incredible? My favorite part is the one hold-out on the bottom right, most visible around the 2:07 mark. Eventually, even that single outlier comes into phase with the rest of the group. The key to this transformation (as highlighted in the referenced article) is the surface on which the metronomes rest. The board as a foundation appears quite rigid and static- though if that were the case, the metronomes would remain out of phase with each other. A closer look reveals that the board in this example is flexible, free to move with the rhythm of the system. As each metronome swings from side to side, the board acts as an “energetic intermediary” that facilitates transfer across the system. It is only because of the flexible surface of connection that this alignment of individuals can occur. What Is It That Brings Us Together? I was drawn instead to the role of interconnectedness in bringing about organizational change. Watching this video makes me wonder, what are the various ways that groups of individuals are connected such that they can reinforce each others’ patterns of behavior? For school leaders: if these metronomes represent our teachers, what are the “energetic intermediaries” that help them move together as one? Mission: Educators are first and foremost passionate about helping kids learn. All nuance aside, developing quality learning experiences for all students is the common bond that connects us all within the profession. When we as individuals allow ourselves the opportunity to reflect on our practices through the mirror of this core belief, those practices that do not align with this mission become more apparent (and are more likely to change). Those acting in isolation of this mission could swing on indefinitely without a reconnection to this common purpose. Social Networks: Educators are also human, which means that we are social creatures. As we connect with others through a variety of social networks, we are more likely to align to those around us. These networks (whether built through online social media tools like twitter and Pinterest or via in-person connections across a hallway or building) allow individuals to engage in the cyclic process of sharing their own practices and learning from others. By staying connected, we become more aligned, and behave more like one system. The system began as a discordant group of individuals, as disconnected parts of a system often do. A rigid, unresponsive figurehead allows individuals to continue in chaotic discordance, much like the static table would have done for the pendulums. This inflexibility limits the power of the leader’s connection. In contrast, a leader who listens to the individuals within the system, reflects shared elements of those individuals’ practices and behaviors, and moves in reinforcing harmony in accordance with those practices can be the true connector that to help otherwise isolated individuals to learn from each other. This kind of responsive connection slowly but surely brings about system-wide alignment, so long as we have the patience, flexibility, and perseverance to allow it to emerge. The wise leader is of service: receptive, yielding, following. The group member’s vibration dominates and leads, while the leader follows. But soon it is the member’s consciousness which is transformed. It is the job of the leader to be aware of the group member’s process; it is the need of the group member to be received and paid attention to. Both get what they need, if the leader has the wisdom to serve and follow. School leaders: Where do you see yourself in this example? Where do you see your school or district? In what ways do you transfer energy from individual to individual throughout the system, and in what ways do you prevent that transfer? What does it looks like when your group members’ vibrations dominate and lead while you follow, and how might that process lead to successful alignment? Please share your successes and challenges in the comments. We just happen to be on the verge of Connected Educators Month, a time that the US Department of Education has identified for us to celebrate “online communities of practice and networks in education.” Your story might just be that one nudge of reinforcing energy that will help those of us connected together through the “energetic intermediary” of the blogosphere to grow together as more successful leaders in the future. I tuned in this evening to watch one of the NBA’s opening night games, the first for the new-look Los Angeles Lakers. The Lakers enter the season with two new additions to their starting lineup- 2-time MVP Steve Nash entering the twilight of his career, and 3-time Defensive Player of the Year Dwight Howard entering the prime of his. Like every new team, these 12 new teammates have their eyes set on winning an NBA championship. I tuned in this evening because I was particularly interested in the addition of Howard as a new potential superstar in the long-time pantheon of Laker centers. How would this team come together? This idea of performing such that the organization can “ride on” reminds me that every new team – a school staff, a leadership team, a grade-level PLC – has its Kobes. For better and for worse, the institutional memory within a team will tend to define the actions of the new team for years to come. How can we help to ensure that those Kobes, these de facto leaders that will grow the future’s leaders, are setting up the organization to continue in the right direction? Like everything else, it starts by finding the right people. Last week, I heard a sports radio interview with Lee Jenkins, the author of a recent cover story for Sports Illustrated chronicling Howard’s transition. Among the many anecdotes of Howard’s arrival in Los Angeles was one about the importance of leadership development, where Jenkins describes the demonstration that Kobe was putting on for Howard in how to practice. According to Jenkins, Kobe led by example – which was nothing surprising, as few others have a comparable work ethic to Kobe. However, he also led by expectation. Jenkins noted that if there was anyone on the court who wasn’t working as hard or as purposefully, then Kobe gave that man what he needed – a high five or a raised eyebrow, a sidewards glare or a sideline encouragement. Kobe was setting the expectation that this is how a Laker practices. I imagine that’s how Kobe treats everything. I can see him thinking, This is how a Laker does pre-game warm-ups. This is how a Laker does a post-game interview. This is how a Laker eats sushi. And this is the lesson we can learn: in times of transition, find your Kobes. Not only the Kobes in the sense that they are the de facto leaders, but in that they embody the ethos of your organization. More than anyone else on that team, Kobe lives and breathes to improve, to practice, to win. Can you imagine the effect if someone else had been Howard’s example instead? The key is understanding what you want your organization to be. What is your mission? What are the key values you represent? Who are the individuals who embody that mission and those values? Find them, and make sure they have a voice – especially among those who are new to the team. In many ways, Kobe is keeping up a mindset instilled in the organization by former coach Phil Jackson, who led the team to 5 championships between 1999-2011. In his book Sacred Hoops, Jackson talks about how important practices are to ensuring that the players on the team become “like five fingers on a hand” as they grow in their understanding of one another. The hope is that Kobe – and any leader – is able to be the glue in the present that connects an organization’s past to its future. Of course, current players are not Dwight Howard’s only mentors: what about those who have since left the organization, but still have a powerful voice? The Sports Illustrated article chronicles a powerful encounter between Howard and NBA all-time scoring leader Kareem Abdul-Jabbar. Following this discussion – a veritible “welcome to the club” if I’ve ever seen one – Howard was so moved by the encouragement by the Hallf of Fame center that he visibly wept. Who are those “former greats” who can bring such a powerful reaction in your newest members? Seek them out, and call them up – the team needs to remember where it has come from in order to find where it will go. As I finish writing this post, Kobe walks briskly to the locker room ahead of the rest of his teammates following an 11-point loss. The Laker offense looked out of sorts, the defense looked a step slower than their opponents, and Howard watched the end of the game from the bench after fouling out. In short, the Lakers looked like a new collection of players still learning how to play together. I look forward to seeing what they look like in March, after a season’s worth of figuring out how Lakers play together.